Service-learning is a teaching method that engages students in solving problems within their schools and communities as part of their academic studies. 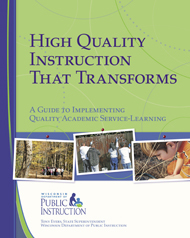 DPI's service-learning implementation guide, High Quality Instruction That Transforms: A Guide to Implementing Quality Academic Service-Learning is available to download. has an enduring positive impact on students' academic achievement, civic engagement, and personal and social development. is an effective instructional pedagogy which asks students to use their abilities and skills to make their school, local, and global communities stronger. is a key strategy in developing 21st century skills which will lead to a prepared workforce and a civically engaged citizenry. These standards and indicators were vetted through a series of "reactor panels" convened nationwide by the National Youth Leadership Council and RMC Research Corporation. The panels were composed of young people, teachers, school and district administrators, community members, staff from community-based organizations, policy-makers, and others interested in service-learning. The process was much like content-setting standards in other fields. Each panel considered the work of the two before them, revising the standards and indicators to ensure that they included the strongest aspects of quality, and to make the wording clearer, measurable, and actionable. Download all Standards and Indicators here.